If you’re like me, you’ve got a load of “membership” or “rewards” cards stacked up in your wallet or dangling on your keychain. So, I was thrilled to find CardStar, a free app by Mesa Dynamics that offers to consolidate all your membership numbers into one handy app for your iPhone or iPod touch. 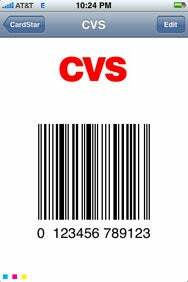 Pick a Card: You can scan membership and rewards cards—like this one for the CVS Pharmacy—into CardStar, carrying that data on your iPhone or iPod touch instead of a wallet or purse. The premise is simple: CardStar stores the numbers (and barcodes) for all of your membership cards. Then, when you want to scan a card, just pull out your iPhone or iPod touch, launch the app, pull up that merchant and scan the barcode on the screen. I was so excited that I downloaded CardStar, entered all of my cards (it’s very easy to do) and then headed off into the world to try it out. First up was my gym. The scanner there is handheld-style model, which works best, according to CardStar’s App Store page. But I couldn’t get it to work until I removed the clear protective cover from my iPhone’s screen. Even then, it took several tries to get the barcode to register. Next up was my neighborhood grocery store. I had to hand my iPhone to the checker so that she could scan the barcode on the flatbed scanner, and this time, I got nothing. (The developers admit that flatbed scanners are problematic.) But even if it HAD worked, I’m not too keen on handing over my iPhone just to save 20 cents on a dog toy. My experience with the app has been mixed, which seems to align with other users’ comments; some App Store reviewers report having had great results, while others have not. Since the app is currently free (though for a limited time)—and the developers appear committed to improving it—then you’ve got nothing to lose (except all those cards in your wallet) by giving it a shot. I like the idea behind this app and plan to continue testing it. But the next time I find a really good deal on dog toys, I’ll just play it safe and toss my key ring to the checker. Honestly, in the long run, that’s probably faster anyway. CardStar is compatible with the iPhone and iPod Touch running the iPhone 2.x software update.